Eat Healthy. Love Life ! Krishna Jayanthi. Sri Jayanthi. Gokulashtami - call it by whatever name. Its one of my favourite festivals, both on the food aspect as well as the nostalgia it brings forth. For it brings forth my grandmom and mom dishing out close to 21 special dishes, all particular to this occassion. The process during my grandmom's time was so long, it used to last days and days with pesky kids like us shooed away from the kitchen, and mom and grandmom locking themselves away in the rather dark kitchen. Rice flour and other flours could not be store bought, so was made from scratch. The aroma wafting from the kitchen was enough to keep us guessing the item being made that day. Coming to today's recipe, its one of my favourites too - Thenkuzhal (literally translated as honey - flutes). but strange coz there is neither honey nor can you play the flute :D .. be it as it may, its a wonderful snack to have it during the festival, but can also be made anytime for a perfect tea time snack. Prep time : 15 mins | Frying time : 15 mins | Makes : Approx 300 grams. Dry roast both the flours. If you are making urad dal flour at home, dry roast the dal on a low flame, cool and powder. You can use store bought or homemade rice flour. Now divide the dough into equal portions, Press a portion into the thenkuzhal dough (with the right nozzle) and press it gently into the hot oil. If you cant press directly into the oil, press it first on a oiled flat ladle and gently immerse it into the oil. Drain on absorbent paper. Repeat for remaining dough. Store them in airtight containers and enjoy a couple with a hot cuppa or tea ! Round up of Kids Delight - Iron Rich Foods, and winner of the Giveaway ! Its always heartening to see fellow bloggers supporting an event close to your heart.. When I chose to host Valli's Kids Delight, I wanted a theme that was healthy as well as kid friendly, so chose Iron Rich Themes. But before that, the winner of the giveaway picked randomly - Kavita Deepan . Kavita - have emailed you, please confirm if you are based in India. Shall mail the gift to you ! Congratulations :) If kavita doesnt respond in 3 days, will choose another winner from India. After Cabbage Dhokla and Microwave Poha Chiwda, its time for some indulgence. Crazy weather here - its deciding in July whether to rain or not, and it finally rained a bit last two days ! Its ok to deep fry once in a while, and these fritters like Bhajia or Pakoras are best eaten without any side dish - just as it is.. Its Saturday and its raining - you dont need a better excuse to indulge in these yummy Masala Vadai hot off the frying pan. I have teamed it up with Coconut Chutney and all that you need after this is a hot cup of tea to savour the indulgence further. By the time I could get my cup of tea, the vadas had disappeared, therefore they appear with just the coconut chutney :)) LoL !! Grind 1/2 cup Grated coconut with 3 tsp fried dal (dalia), 2 small green chillies, little tamarind and 2 pods of garlic with 3-4 TBSP of water to a smooth paste. Add a pinch of salt. Temper with mustard if required. Wash and soak all dals separately for 2 hours. Drain and grind to a smooth paste (use the soaked water to occasionally wet the batter, but dont use more than 3 TBSP). This batter is similar to the Urad Dal vada batter. Grind all ingredients under Masala paste to a smooth paste with very minimal water. Add this masala paste to the ground lentil paste. Mix well. Now if making immediately, add salt and onions and curry leaves and coriander. Else refrigerate and add these later on. Mix the batter lightly after adding the onions, we want to retain the fluffiness of the batter. Meanwhile heat oil for frying. When it reaches the right temperature, flatten out a small portion of these vadas and deep fry on medium heat till golden brown. Use the rest of the batter to make Vadai. Drain on absorbent towels. 4-5 pm is where most diets go for a toss, even if you eat healthy through the day. Fruits may not be appealing most of the while, and time may not permit you to have a full snack / tiffin especially if you are working. For those who are at home - Puli Aval or Gojjavalakki (Tamarind Poha Upma) , corn chaat, masoor salad, Fruit Chaat may be made instantly. Today's dish - Microwave Poha Chiwda (guilt free flattened rice snack) help quell those hunger pangs - whether you are at home or working. Poha (or Aval in Tamil / Avalakki in Kannada) is rich in fortified calcium and B12 making it an easy way to absorb those vitamins. We make Curry leaf Poha Upma regularly for breakfast. As with most people I used the Microwave initially to just reheat food or steam veggies, till I started using it more efficiently. I have another Poha Chivda recipe(deep fried version).. In this dish, the thicker Poha is used (you may use thin variety also, but the taste greatly varies). I have followed Madhura's recipe to make this. It doesnt consume too much oil. The copra and peanuts are optional, but adds to the crunch - dont skip it. Make a large batch of this, and you can find yourself digging into it more often than you think. Also sending this dish to BM # 42 under quick tiffins and my own event - Calcium rich recipes hosted by PJ. In a microwave safe bowl, heat oil for 2 mins, add mustard seeds, red chillies, curry leaves and micro for 1.5 mins in spurts. Add peanuts and micro for 3 mins, stirring after every minute. Now add Poha , mix well and micro for 3 more mins in a gap of every 1 minute, stir well and micro again. Toss well, and store in an airtight container. A typical day at the supermarket / vegetable mandi. : Capsicum - first picked. Tomatoes - picked. Onions and Potatoes - done. Greens- picked. Brinjal - ummm, not so good, but do summers have any other vegetable? And then comes the dreaded cabbage- Mind says dont pick, but budget demands otherwise. We are not much of a cabbage fans,ourselves, and S often declares the cabbage sabji as Pullu (Pullu in Tamil is grass! ), fit to be eaten by cows and other such animals. Sigh! With the mercury soaring (its almost July and the rains are peeking here and there) and the household budgets doing an unhealthy trip to the skies, I sometimes wonder how our parents used to beat inflation. Not that we dont like Cabbage Vadai (recipe soon! ), but deep fry in my house is restricted to max once a month, that too if its warranted. So, the workable vegetables in my refrigerator were onions and cabbage, and the clock ticked away declaring the arrival of the little one from school. This goes to Blogging Marathon # 42, and do check out the fellow marathoners here. 1) In a pan, heat 1 tsp of oil and saute shredded cabbage and onions with a pinch of salt till they turn slightly soft. 2) Cool the veggies and add to the batter. Adjust salt, chillies. Add soda and mix the batter to pouring consistency. 3) Grease a medium shallow plate, and pour the batter. Steam in an Idli steamer for 10 - 12 mins till done. 4) Cut to desired shapes. 5) Prepare the tempering with oil, mustard seeds, asafoetida and sesame seeds. 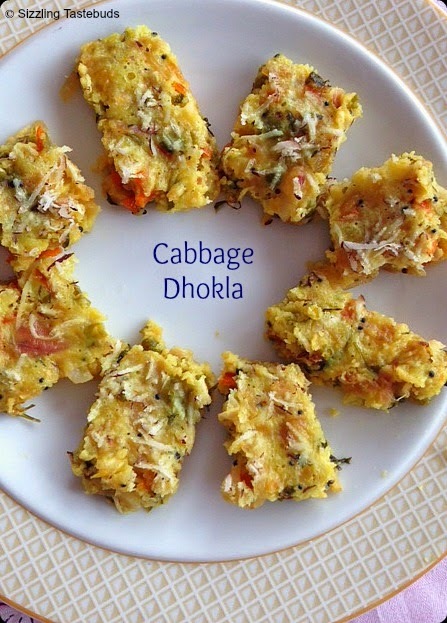 Cool and add to the cooled dhokla. 6) Serve warm with Tomato Pachadi or just Ketchup. © Sizzling Tastebuds 2011 - 2020. Powered by Blogger. No Fry Dahi Bhalle , and a perfect antidote to scorching summers !